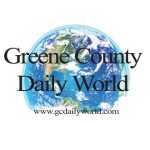 One person was booked into the Greene County Jail recently. Jack D. Farmer Jr., 36, Bloomington, was arrested on a preliminary charge of possession of marijuana. Bond set at $500 with 10 percent allowed.